The British Newspaper Archive is full of grisly stories about the unusual and the unexplained. We’ve selected some of the oddest tales, including a description of a monster with the head of a sea lion and a rumour that Germany was turning dead soldiers into explosives during the First World War. Let us know if you’ve found a story to rival these. You can comment below or post on our Facebook page. A very strange creature was sighted in St Genevieve, Missouri in 1877. 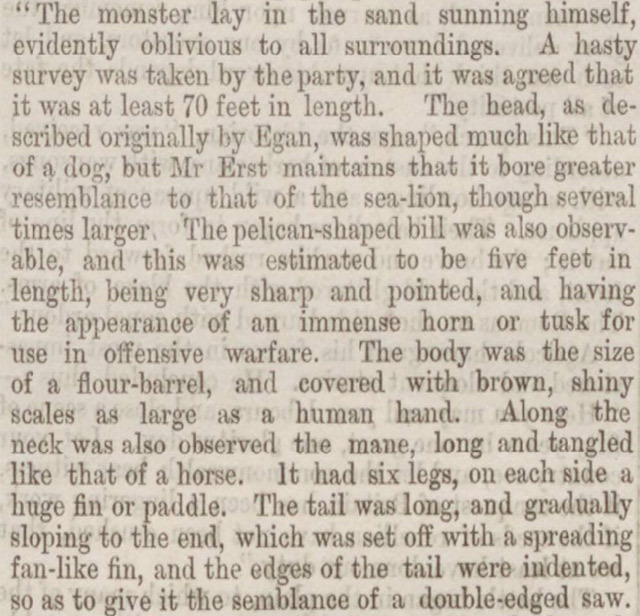 The Dundee Courier included a detailed description, stating that the monster was ‘at least 70 feet in length’, with the head of a sea lion and a tangled mane like a horse. The ‘immense horn’ on its head was shaped like a pelican’s bill and it had a long tail that looked like a double-edged saw, with ‘a spreading fan-like fin’ at the end. According to the article, the beast made no sound apart from ‘an occasional puff, loud and sonorous, similar to that of the sea-cow’. 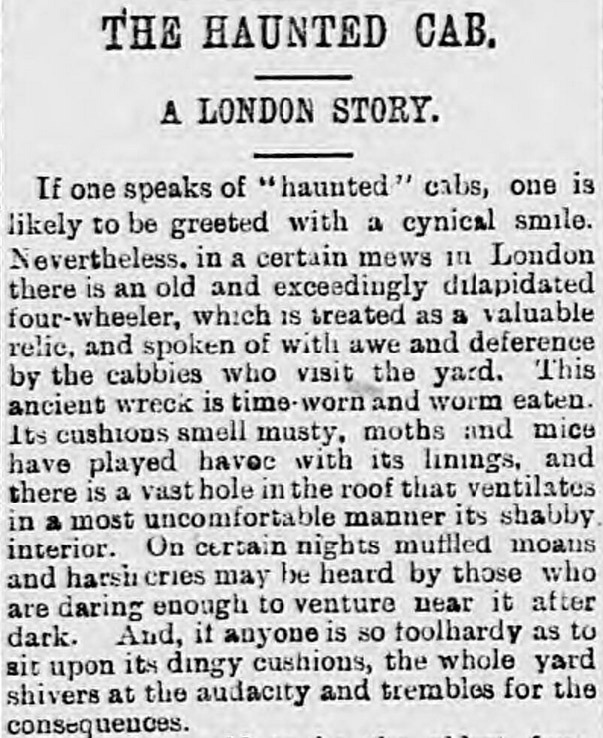 According to this spooky story from the Shields Daily Gazette, you could hear ‘muffled moans and harsh cries’ coming from a dilapidated London cab if you were brave enough to go near it on dark nights in 1897. The article goes on to explain the story behind the haunting. On a dismal night, the cabbie picked up a man who was on the run from some invisible enemies. After frantically driving his vehicle away, urged on by his fare’s terrified screams, the cabby discovered the man had committed suicide in the back of his taxi. Within a few days, the driver was also found dead in his cab – apparently strangled ‘by the ghost of the suicide’. The Illustrated Police News was full of reports about strange crimes and odd occurrences, including this story about the narrow escape a woman had in Limoges, France. As her coffin was being carried into the church, some mourners insisted that they heard knocking coming from it. It was quickly opened and the woman was found ‘alive and conscious, although terribly frightened at the awful ordeal’. 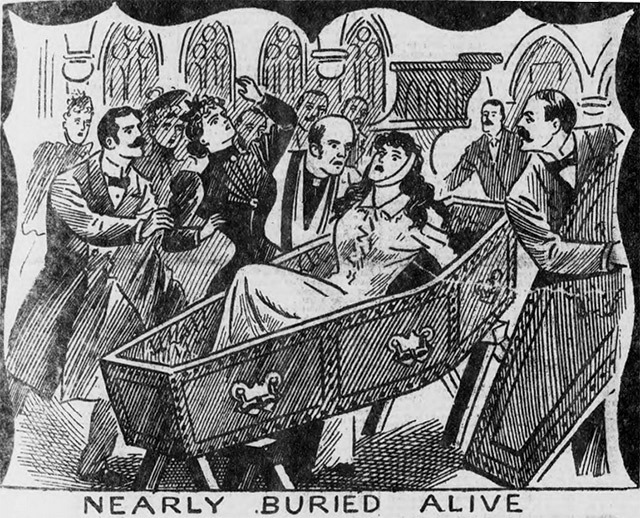 It seems she had mistakenly been pronounced dead while she was actually suffering a cataleptic fit. 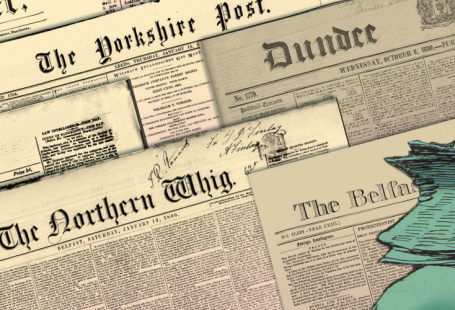 The Sheffield Evening Telegraph was one of many newspapers to report a shocking rumour during the First World War. 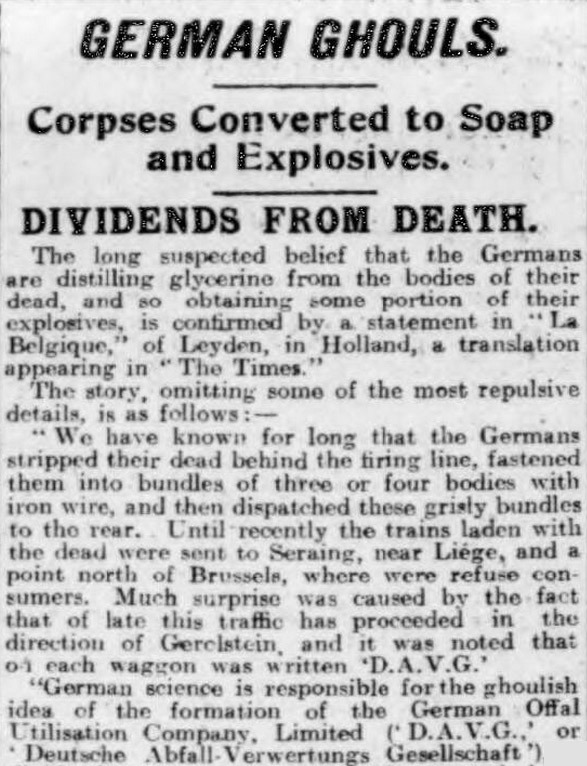 In April 1917, it stated that the Germans were ‘distilling glycerine from the bodies of their dead’ to make soap and explosives. 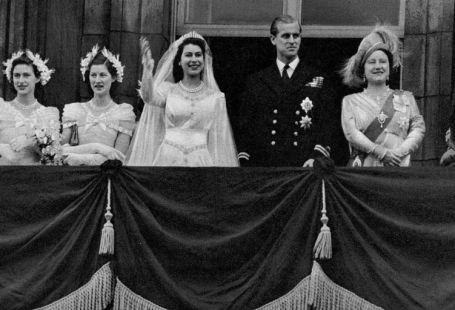 It is thought that the report was actually anti-German propaganda, and in 1925, the British Government announced that there had never been any foundation for the story. A strange and terribly sad story was printed in the Illustrated Police News in 1883. One night, a young girl set off to visit her grandparents and heard footsteps behind her. She ran for her life and fainted with exhaustion and terror at the door of their house. 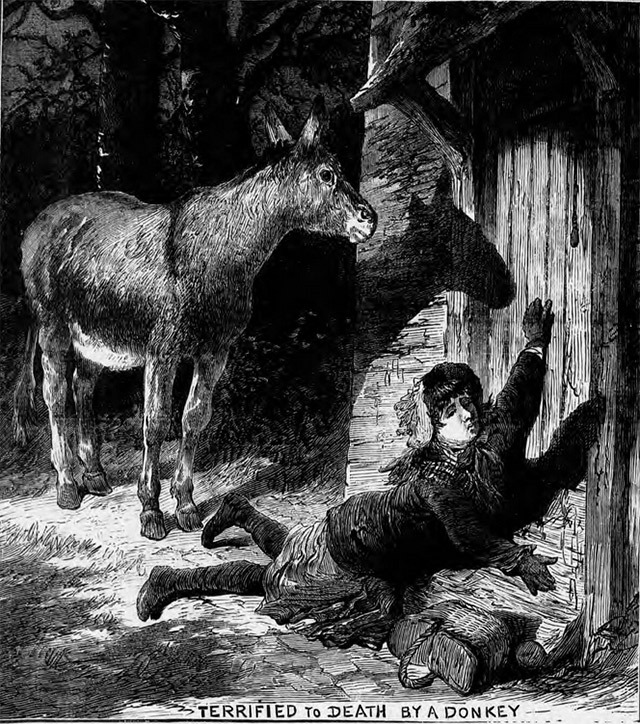 The child’s grandfather found her and noticed his donkey standing close by. The poor child had evidently been frightened by the sound of the animal following her home. 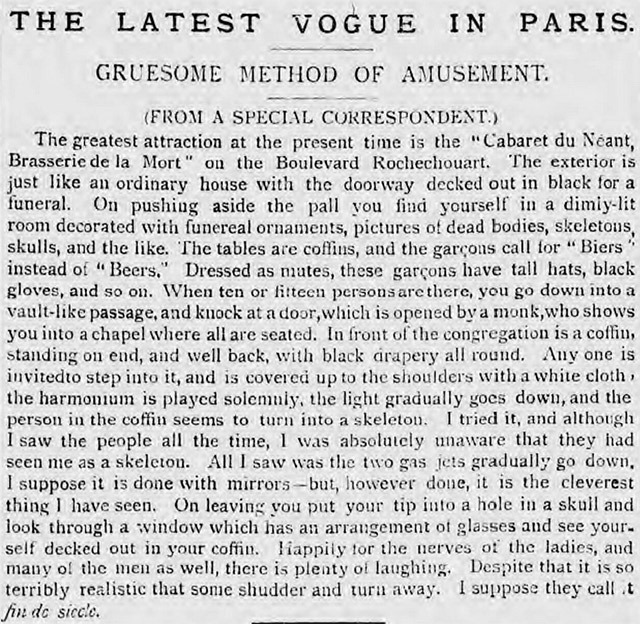 The Cabaret du Néant was a rather bizarre nineteenth-century bar, decorated with skeletons, pictures of dead bodies and coffins. According to this article from the Pall Mall Gazette, patrons could even take part in an eerie faux funeral. After stepping into a coffin, you would be covered ‘up to the shoulders with a white cloth [as] the harmonium played solemnly’. The lights would go out and you would appear to turn into a skeleton! 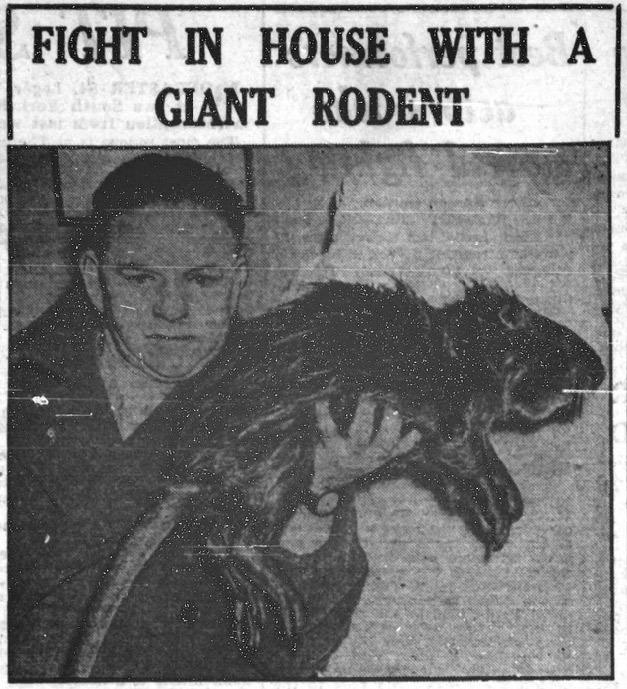 Not to be outdone by Victorian newspapers, the Yorkshire Evening Post printed this terrifying image of a ‘giant rat-like animal with webbed feet and teeth an inch long’ in 1951. The creature was 19 inches long with a 15-inch tail and was found in a house in Creskell Grove, Leeds. According to the article, it took a rat catcher and the RSPCA two hours to capture the rodent. 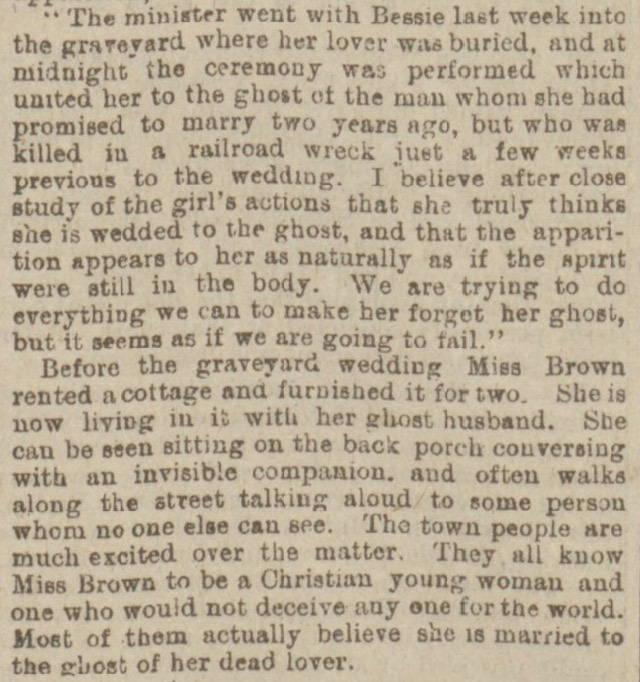 On 15 January 1901, the Sunderland Daily Echo reported that Bessie Brown of Cameron, Oklahoma had married a ghost. The writer explained that Bessie’s fiancé had died a few weeks before their wedding and, after his spirit appeared to her, she decided she would marry his ghost. The article reported that Bessie had moved into a cottage with her husband and that ‘persons who pass the house can hear them talking and laughing just as if they were both in human form’. Victorian fashion could be more terrifying than stories of ghosts and ghouls. 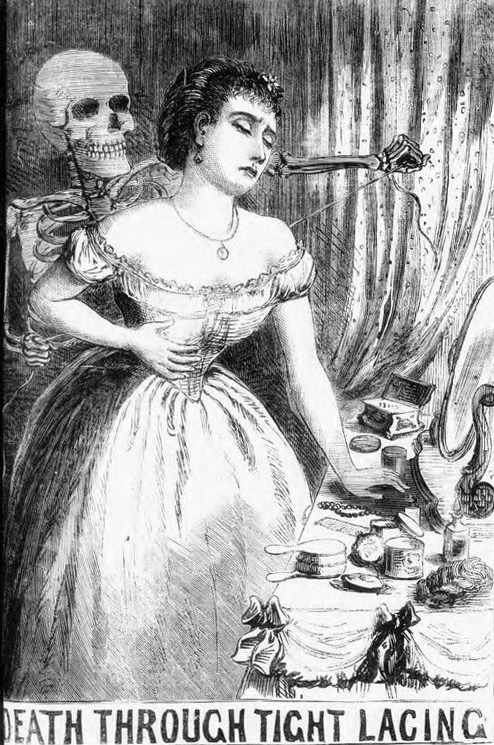 This image accompanied a report in the Illustrated Police News about a young woman who was killed by a corset that had been laced too tightly. The newspaper stated that the lady collapsed while dancing at a ball because ‘the heart’s action had been impeded [and] the excitement and exertion was, under the circumstances, too great a strain upon the system’. 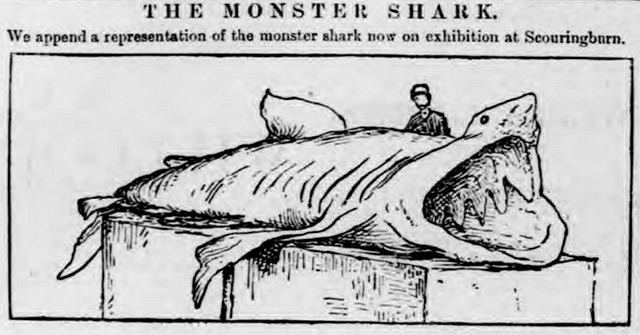 A giant basking shark was found 25 miles to the east of Bell Rock in 1886. The Dundee Courier reported that it was 31 feet in length and 17 feet in girth – much larger than a typical basking shark. The ‘monster shark’ had eight rows of teeth and was exhibited in the Scouringburn before being handed over to the University College of Dundee. 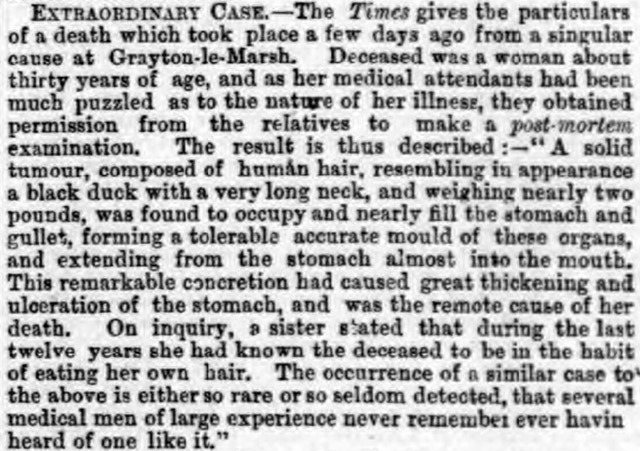 A horrifying discovery was made when a young woman died in Grayton-le-Marsh, Lincolnshire in 1869. The Liverpool Daily Post reported that her medical attendants found that her stomach and gullet were full of a mass of human hair. The woman’s sister was questioned and stated that ‘during the last twelve years she had known the deceased to be in the habit of eating her own hair’. I do not understand the idea of publising such dreadful stories. There are lots of awful situations in our every day life. Why do we want to read about the old-fashioned issues? Visit https://highschoolgems.com if you want to rea something for pleasure and entertainment. Hey you must have to get about the features of deleting bing browsing history from your pc that really helps you to boost up your browser speed in easiest way with the help of our tutorial. I know this token of a conspicuous subject, a recognized trooper, and a fit and productive legislative head of our state will be fortunately gotten, completely valued, and deliberately saved by the inhabitants of the place where he grew up. That is so amazing post. Want to probe web pages by using desirable home pages which give home elevators supplied issue and theft to coach all of feeling and coaching of that faculty. We take a look at what the physical and emotional causes might be, and offer some practical tips to help you stay calm and deal with the situation. There are lots troubles come up getting a trader, traders jobs is not sometimes they have to do under squeeze position. This is an unbelievable rousing article. I am fundamentally satisfied with your great work. You put truly exceptionally lodging data…Amazing Work..! Strange stories from the past it’s my hobby. I like to read something like this if you want to read about the historical adventure visit a https://essays-service.com/write-my-annotated-bibliography.html.